BEN Rhydding enjoyed a great finale to a fantastic season, finishing in the medals at the England Hockey National under-16 finals at Lee Valley Olympic Park. 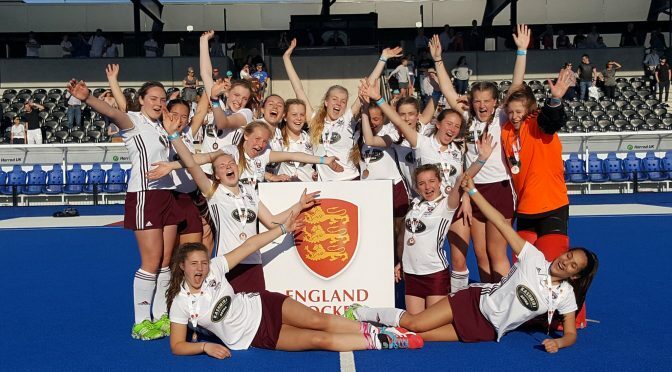 Group matches against Reading, Marlow and pre-tournament favourites Surbiton were always going to be tough, but the Ilkley girls rose to the challenge. 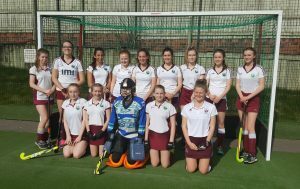 After a tentative start against Reading which saw keeper Sophie Dale make a fine save and their goal frame rattled by a penalty stroke, Rhydding got into their stride. They took the lead when Lucy Williams’ shot was parried into the path of Niamh Brennan who made no mistake. Reading’s equalised early in the first minute of the second half with a well-taken short corner. Despite the setback, Rhydding remained calm and built pressure through the good work of Imogen Sunman and Freya Bellamy. A Rhydding short corner was despatched by Kirsty McMillan, timing her run to left post to perfection. A 3-1 win was sealed when another short corner was finished in fine style by an Izzy Weir deflection. Next up were a confident Marlow side and despite enjoying the majority of possession, Rhydding failed to convert their chances and saw numerous short corners unrewarded. Marlow defended from deep, and frustrated the Rhydding attack, denying them time and space on the ball. A scrappy game looked to be heading for stalemate until Williams saved the day with a well-worked short corner late in the game. Six points in the bag on day one meant Ben Rhydding were guaranteed one of the top-four placings in the championships. Defending champions Surbiton were the team to beat on Sunday morning, and Rhydding needed a win to qualify for the final. In one of their best performances of the season, the Ilkley side gave it their all, challenging every ball and giving no quarter in the tackle. Rachel Scott and Milly Fewlass-Jones defended valiantly, preventing numerous Surbition attacks down the flanks, as Ben Rhydding packed the middle of the pitch and limited their rivals’ attacking options. Nisha Cant and Evie Malir marshalled the defensive unit confidently, distributing well to midfield. Surbiton’s frustration grew as time ticked away, and Ben Rhydding tried to take advantage of turnover ball to grab the all-important goal. Brennan and Jemima Jaggar both going close. Just as a goalless draw seemed inevitable, Surbiton earned a late short corner with just 34 seconds left on the clock, and it was heartbreak for Rhydding. With both sides guaranteed medals, Stourport and Ben Rhydding battled valiantly for third place. Stourport’s early lead was soon erased with a Cant short corner. Rhydding fell behind again, only for Cant to equalise once more from another short corner. The second half saw both sides visibly tiring after two days of competition, Alicia Cumberland stepped up with some crucial tackles to keep the opposition at bay and Hadfield was on hand to clear the lines when needed. Dale stepped in with a couple of top class saves to deny Stourport, and Ben Rhydding rallied again, surely thinking the win was theirs as McMillan found space in the D to turn and fire home with just minutes remaining. The last word was with Stourport. They capitalised on a momentary lapse in Rhydding concentration to drive down the right and equalise in the last minute. It meant third place would be decided on penalty flicks, but it was not to be Rhydding’s day as Stourport’s strikers kept their cool to take victory. 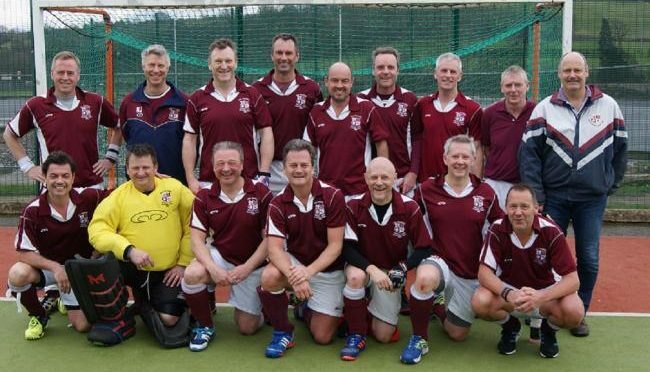 Having won the England Hockey Masters (Over 50s) title in 2014 and 2016, the Ben Rhydding Men are preparing for their third final in four years at the end of April. As last year they will be playing on the main pitch at the Lea Valley Stadium – on April 29th at 9am. Although slightly disappointed by the timing of the game the team are looking forward to a great day and hope that plenty of supporters will make the trip. After many away ties, Ben Rhydding had a home match in the semi-finals, with Isca – a club with veterans’ pedigree – making the long trip from Exeter. They weren’t the only ones travelling some distance for the match, however, as key Ben Rhydding players Mark French and Brian Kempson broke holidays to take part. The first 15 minutes were tense, with Isca having the majority of possession and territory but the defensive unit of French, Neil Horsman, Neill Moore and Hugh Lambert holding firm to snuff out any visiting attacks. David Cutter had a great chance to put Ben Rhydding ahead but lunged too far and suffered a hamstring injury, which ruled him out of the rest of the game. Ben Rhydding thought they had gone ahead when a penalty corner was scored, only to see that, as the ball crossed the line, the umpire had blown and awarded Rhydding a penalty flick. The penalty was missed and, in such a tight contest, either of these incidents could have tipped the balance against the hosts, but this is a team with genuine mental resilience. The midfield trio of Kempson, Rob Ward and Richard Pughe were starting to gain an advantage over their quality opponents and, as the game continued, they used their strong bench to keep up with the pace of the contest. Jonny Till had replaced Cutter to join Ian Cussons and Tony Wing up front, with Howard Pickard and Mark Westwood bolstering midfield. It was halfway through the second half when Ward got on the end of a ball in the middle of the D and slotted home the only goal of the game. Although Isca pushed hard for an equaliser, Rhydding kept possession in their opponents’ half, seeing out the game. 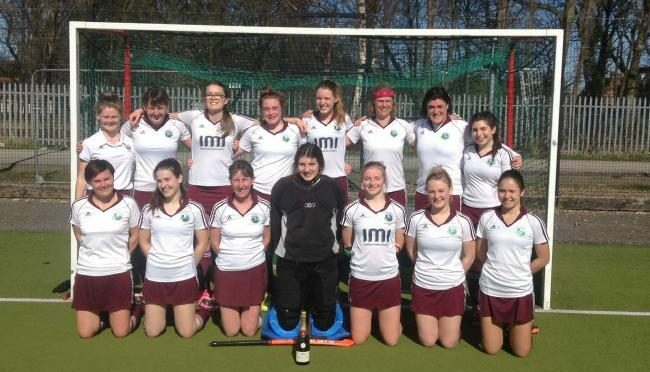 BEN Rhydding crowned their Yorkshire Women’s Division One title-winning campaign by finishing their 22 game programme with an unbeaten record. The title and promotion were already secured so the challenge in their final game on March 25th was to avoid defeat. Rhydding’s defence had only conceded nine goals in 21 games and their early work was confident and secure. At the other end of the field the Rhydding attack tested and stretched the opposition with their fluid passing game. A 1-0 half-time lead was a scant reward from some excellent attacking play. The only goal was scored by Niamh Brennan. The second half was less than straight forward as Hull equalised with a contested goal. The setback was just what Rhydding needed as they quickly responded with a hat-trick from Freya Bellamy. It meant they finished the season with 20 wins and two draws having scored 74 goals and conceded just ten. Their dominance of the league is reflected by the 22-point gap between themselves and second-placed Bridlington. The end of season awards reflect the outstanding quality of the young players within the squad with Abi Prentice being nominated by her team-mates as player of the season and Rachel Scott receiving the captain’s award for her outstanding contribution. 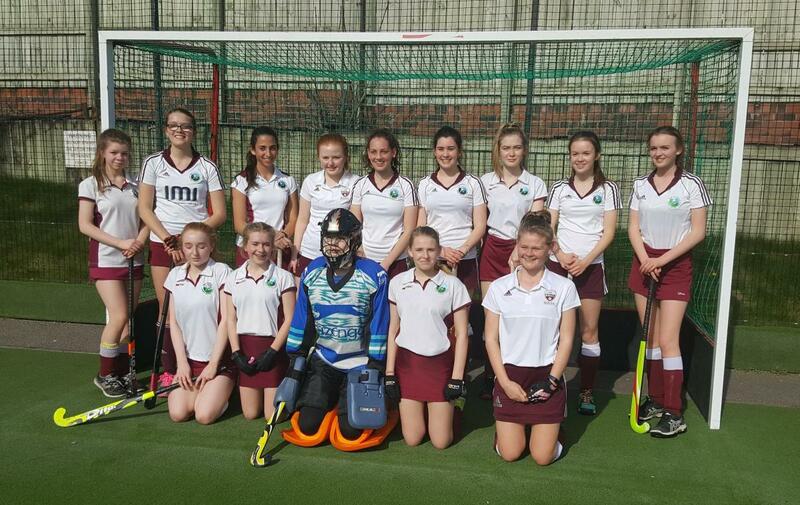 BEN Rhydding’s under-16 girls A and B created club history on Sunday March 26th when they both competed in the Yorkshire League play-offs. This follows the A team winning through to the National Finals on April 7/8th at the Lea Valley Stadium. It is the first time that both the club’s teams have reached the finals. The B team (pictured above) underlined their improvement this season as they put in some great performances as they took on A teams from Wakefield, Harrogate and Thirsk in their group. Julia Cumberland led her team confidently throughout, marshalling the defensive unit. Lily Gazeley and Grace Murtagh worked tirelessly in midfield, closing down opposition and winning turnover ball. Ben Rhydding’s forwards were never going to have an easy day out, but Darcy Hartley and Beth Day made good use of the opportunities to attack, ably supported by Eva Hanlon and Hannah Hall. Despite not qualifying for the semi-final, the B team have had a fantastic season, and the future bodes well, with most of the team still under-16 next year. Ben Rhydding’s A team faced a different pressure. They were the team to beat having won the league while remaining unbeaten. They squeezed past Doncaster with a single goal from Kirsty McMillan who was also on target in the 4-0 win over Wakefield B 4-0. It meant Ben Rhydding were in the semi-finals with one game to play. Their final group match saw them beat York 3-1 to top the table. McMillan (2) and Becky Hadfield were their scorers. Ben Rhydding were soon into their stride in the semi-final against Thirsk. McMillan slipped the ball home to give her side an early lead before unleashing an unstoppable top corner strike which Thirsk were unable to recover from. They piled on the pressure and reduced the deficit with minutes remaining, but Rhydding held firm to secure a place in the final against Wakefield A. These two sides have met so many times in recent years and produced a fitting finale worthy of this competition. Despite visibly tiring after two hours of hockey in the sudden March heatwave, both teams gave it their all with an end to end display of competitive hockey. Both sides saw short corners go agonisingly close and the two keepers made outstanding saves to keep their side in the game. This encounter was always going to go to the wire, and it was to the delight of the Ben Rhydding supporters that Lucy Williams was rewarded for her fine performances throughout the day with the goal that eventually secured the title after a neat interchange with Hadfield. 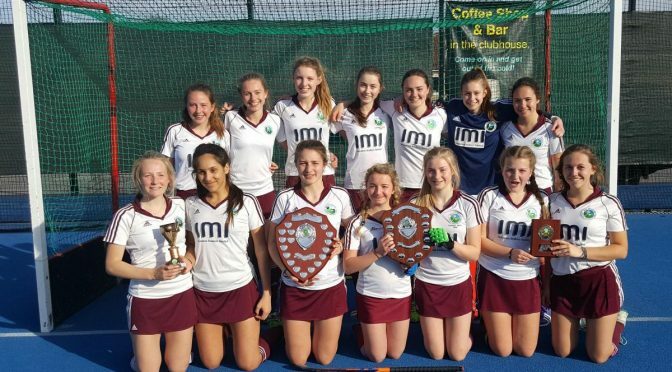 Ben Rhydding’s U16 girls have become the first girls colts side in the club’s history to qualify for the National indoor finals. At the North championships in Bradford on Saturday, the Ilkley side took on opposition from across the North of England, needing a top two finish in order to qualify for the National finals in January. 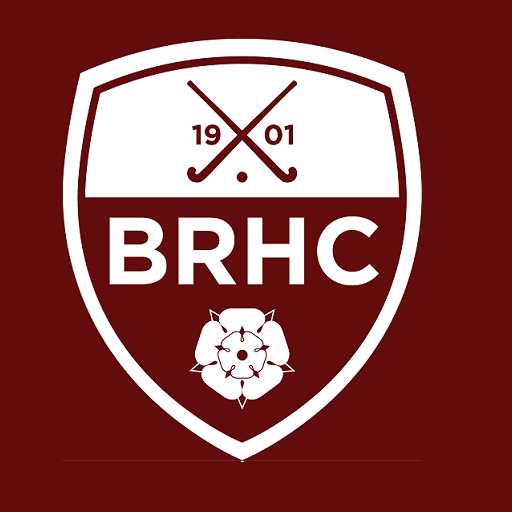 Having had their first taste of indoor competitive hockey in last season’s competition, Ben Rhydding showed no sign of nerves as they notched up a 4-1 victory against Brooklands in their opening fixture, followed up with a confidence-boosting 4-0 victory over Thirsk. Local rivals Wakefield always prove tricky opposition, and an end to end game saw both sides go close to scoring, but it was Ben Rhydding who took the points with a smartly taken drag flick from Evie Malir. With maximum points from three games, Ben Rhydding were the team to beat, and Bowden piled on the pressure early on, equalising Rhydding’s opener and looking dangerous on the break. Ben Rhydding soon regrouped, however, and were quickly back in charge, running out 4-1 winners with Bowden unable to respond. With national qualification all but secured, Ben Rhydding did not ease up, and ensured they finished the day on maximum points with victories over Huddersfield and Doncaster to top the group as North Champions. 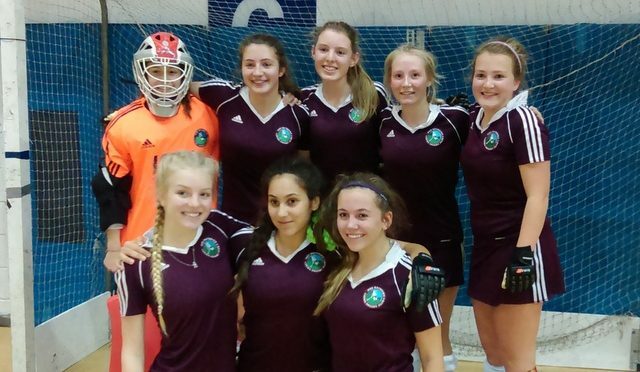 Goalkeeper Sophie Dale, supported by a defensive unit of Malir, Becky Hatfield and Rachel Scott conceded just three goals in six games, whilst Rhydding’s strikers Nisha Cant, Izzy Weir, Kirsty McMillan and Lucy Williams proved unstoppable, notching up 25 goals scored. Ben Rhydding now look forward to the National finals in Wolverhampton on 21/22 January. Last Saturday saw a goal fest on Coutances Way – some good and some not so good. The Ladies 1s game against Belper was the highlight as they finished 6-1 winners. Six goalscorers in Ellis, Wilson, Whitehead, Cordukes, Trafford and Janzen. Meanwhile a ‘comp;acent’ Mens 1st team were undone by an on-fire recently promoted Lancaster & Morecambe 7-3. Full reports on the Ilkley Gazette website. This Saturday the Ladies have the morning slots with the 3s entertaining Bingley Bees (10.330) and the 5s entertaining Northallerton at noon. Then the men takeover with the 4s at home to Wakefield at 1.30 and the 2s in their first league match of the season playing Sheffield Uni Bankers at 3pm. The lower Mens teams are struggling to get teams out and there is a general plea to all those who might be thinking of playing this season to get a move on – or we might end up having to withdraw teams from the leagues. Please speak to James Snook or any team captain. Don’t forget that the Mens section have a special offer of 50% off the annual sub for first time members. There will be an informal social at the club on Saturday as you are invited to witness the demolishment of the Aussies in the Rugby – there will be a barbecue and plenty of (cheap) beer. The Barbecue will be available from about 7 and the game starts at 8. Men’s training takes place on Wednesday evenings and new coach, Andrew Lorimer, is pleased with the numbers attending but is hoping to see a few more as the season goes on. 8.30pm – 10pm. Subs are now due and should be paid as soon as possible – the deadline is Oct 31st. The Men’s section have a special offer this year for new joiners with a 50% discount on the annual sub. The Men’s section have also had to postpone some early season games due to unavailability. James Snook (schnabbs93@gmail.com), the new Chair of Selectors, and the team captains are keen to hear from all those who can play this season.